Creme Brulee: Crème brûlée or Creme Brulee also known as burnt cream, crema catalana, or Trinity cream is a dessert consisting of a rich custard base topped with a contrasting layer of hard caramel. It is normally served at room temperature. It is a very famous French dessert. Creme Brulee is usually served in individual ramekins. Discs of caramel may be prepared separately and put on top just before serving, or the caramel may be formed directly on top of the custard, immediately before serving. To do this, sugar is sprinkled onto the custard and then caramelized under a salamander broiler or with a butane torch. The custard base is traditionally flavored with vanilla, but can also be flavored with a variety of other flavorings. Split the vanilla pod lengthways and scrape the seeds into the cream. Chop the empty pod into small pieces, and add them to the cream. Meanwhile, in a separate bowl, beat the sugar and egg yolks together in a large heatproof bowl until pale and fluffy. Bring the cream back to boiling point. Pour the boiling cream slowly over the egg mixture, whisking continuously until thickened – this indicates that the eggs have begun to cook slightly. Strain the mixture through a fine sieve into a large jug. Use the strained mixture to fill 8 ramekins to about two-thirds full. Place the ramekins into a large roasting tray and pour in enough hot water to come halfway up their outsides. This is called a bain-marie. Place the bain-marie onto the center shelf of the oven. Remove the ramekins from the water and set aside to cool to room temperature. 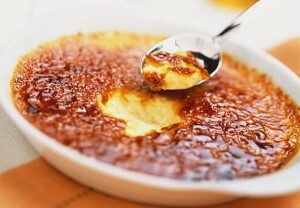 When you are ready to serve, sprinkle one level teaspoon of caster sugar evenly over the surface of each creme brulee, then caramelize with a chefs’ blow-torch. Creme brulee is ready to be served. Set aside to cool for a couple of minutes and then serve. If you have any queries regarding the Creme Brulee recipe, please leave a comment.